Back in the late 1970s a local UHF station in my Detroit market, WKBD TV-50, ran a summer series consisting of long unseen, rarely syndicated-by-then sitcoms from the 1950s and early-‘60s, most of which never turned up anywhere else since. These included The People's Choice (starring Jackie Cooper), How to Marry a Millionaire (based on the movie, and featuring Barbara Eden), December Bride (and its spin-off, Pete & Gladys), Topper, My Little Margie, Love That Bob! (aka The Bob Cummings Show) and others. What prompted the airing of this collection of old shows? Maybe the local station had rights and the prints were collecting dust, or perhaps some enterprising distributor packaged them together and syndicated them nationally. I have no idea. Some of these were pretty tepid, but others were great. The one I liked the most is also by far the most obscure: Colonel Humphrey Flack, which starred British character actor Alan Mowbray and Frank Jenks as a pair of con men who con other grifters, usually to help someone who's been ripped off. Sort of a precursor to The Sting, the series is quite funny yet remains almost completely unknown. 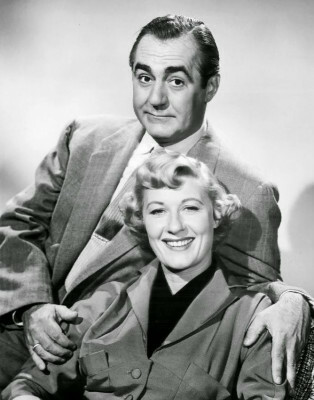 Another series that popped up those long-ago summer nights was I Married Joan (1952-55), starring Joan Davis, with Jim Backus playing her husband. Once a popular Vaudeville and radio personality, today's Davis is remembered almost exclusively for this three-season series, as well as for memorably appearing opposite Lou Costello in the classic Abbott & Costello comedy Hold That Ghost (1941). She's so good in that, and the movie was such a colossal hit, it seems perverse they weren't reunited for other A&C vehicles. Plagued by health problems, she died in 1961 of a heart attack when she was only 48, a tragedy made much worse when her mother, daughter (Beverly Wills, who appears in some episodes), and two grandchildren died in a house fire less than two years later. I Married Joan debuted on NBC one year to the day after the premiere of I Love Lucy on CBS, with I Married Joan obviously modeled after that mega-hit. Like Lucille Ball, Davis had been a major presence in postwar radio and, unlike Ball up to that point, famous as a rubber-faced physical comedienne. Like Lucy, I Married Joan's scripts function mainly as an excuse to put Davis in a wild physical humor set-up, and like Ball, Davis had an anything-for-a-laugh willingness to be made to appear utterly foolish. What's missing from the series are engaging plots and motivation driving Joan's Joan Stevens to do all the crazy stuff she does. Lucy Ricardo, of course, was always trying to break into show business or earn extra money when her allowance ran out, or to teach Ricky (and sometimes also Fred Mertz) "a lesson," but Joan mostly does what she does simply to please her husband. He's a respected judge and she just wants to be a larger part of his world. That's another problem. Speaking in his normal, non-Magoo/Thurston Howell III voice, Jim Backus plays Judge Brad Stevens, Joan's husband, genially but blandly. Unlike excitable, often-exasperated Latin Ricky Ricardo, Brad is almost painfully understanding toward his wacky wife. Backus has no character to play, and no opportunity to be funny himself. Nevertheless, Davis was popular enough that I Married Joan limped along for three seasons, producing enough episodes (98 half-hours) to be syndicated. It did very well in that market, until all those family deaths resulted in the program being pulled until the estate arrangements could be worked out. By the time that dust had settled, demand for I Married Joan reruns had waned considerably and the series languished in obscurity for many years, though it did eventually turn up on cable for a time. VCI's region-free release of I Married Joan offers 10 complete episodes on a single disc. Licensed from Blair and Associates, in reasonably decent shape, video- and audio-wise. The no-frills disc has no subtitle options or Extra Features. Mild family entertainment, I Married Joan is no lost classic of television comedy, but it does serve as a showcase for Joan Davis, a real talent, whose career was prematurely cut short. Mildly Recommended.